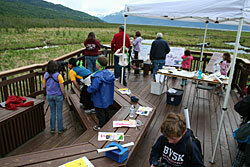 Where: Potter Marsh boardwalk, Anchorage Coastal Wildlife Refuge - 2880 East 154th Avenue, Anchorage, AK; located at Mile 117 along the Seward Highway approximately 10 miles south of downtown Anchorage (approximately 1/2 mile south of the Rabbit Creek Road exit and across from the Rabbit Creek Rifle Range). 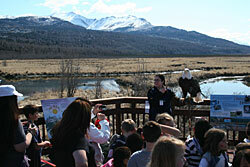 Event: Help celebrate Anchorage's most popular wildlife viewing area at this free annual event. This family-friendly nature festival brings you birding stations along the boardwalk, captive birds from Bird TLC, educational animals from the Alaska Zoo, archery and spin casting practice, hands-on nature activities for kids, release of a rehabilitated wild bird, and more. A food vendor will be on site; parking available nearby; restrooms and entire facility are accessible to those in wheelchairs. Event sponsors include Alaska Department of Fish and Game, Alaska Geographic, Alaska Sea Life Center, Alaska Zoo, Anchorage Audubon, Anchorage Museum, Anchorage Waterways Council, Audubon Alaska, Bird TLC, Casting for Recovery, Ducks Unlimited, Friends of the Anchorage Coastal Wildlife Refuge, Municipality of Anchorage – Parks and Recreation, U.S. 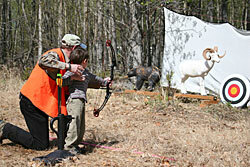 Fish and Wildlife Service, and U.S. Forest Service. For information, contact Joe Meehan at (907) 267-2281 or joe.meehan@alaska.gov.